I know that most of you love this time of year. Summer is my favorite season. Fall is kind of growing on me, I suppose, but every year at this time my skin starts getting confused. In the summer, at least I *know* my skin is pretty oily. I can handle that. In the winter, I *know* my skin is dry as the Sahara Desert. When the weather starts to change and we have so many ups and downs, my skin becomes pretty termperamental. I have a semi oily nose and forehead right now, but very dry cheeks and chin. My cheeks are dry. This is when everything seems to go awry and I can never find the right moisturizer. I have my go-to winter time one, but right now is tricky. 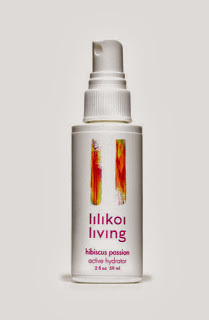 Thankfully, I was just able to try an amazing new facial care line called Lilikoi Living. I have to say "thank you" to the lovely blogger behind City Life Eats for introducing me to the line! 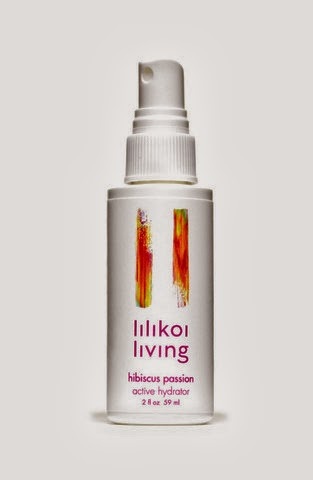 My absolute favorite product tried (and they are all quite lovely) is called Hibiscus Passion Active Hydrator. This is a unique spray on moisturizer. It is so convenient and is very hygienic! You are not sticking your fingers in a jar, nor do you have to worry about a drippy tube. This is brilliant. You simply mist the hydrator on and it leaves your skin feeling immediately quenched. It is truly a drink for your skin! Do you see why I am truly loving this product? Hyaluronic acid and squalane are near the top of the list, as are flax seed or borage oils. You will find ultra soothing chamomile, white tea, cucumber, lycopene-rich passion fruit, and more. This product would work extremely well for sensitive skin types. The product packs a punch when it comes to being crafted with ingredients proven to benefit the skin and rivals high-end spa products. I love that the products from this company are hand-crafted, toxin-free, and without the nasties this blogger avoids. June-wei Sum is the woman behind Lilikoi Living. She has created something really special with this line. Her creations really are unlike others on the market and I would love for you to check out this company's natural skin care products. Chic & Green Grade: I rate this product an A. *Disclaimer: I received products to sample for review. As with all products reviewed, this in no way has impacted the outcome of my review and all opinions are my own.